Unsustainable use of subsurface environment is escalating. Can geologists find solutions? one usually thinks of 'the environment' to mean rivers and seas, air and oceans, fields and forests, and the animal world. In other words, the hydrosphere, atmosphere and biosphere. But an equally important part of the environment is the lithosphere or the earth's inner crust. Shallow parts of the lithosphere are every bit as fragile as the earth's surface environments. They are just as threatened by unsustainable use, for instance, by over-exploitation of minerals and petroleum, or by pollution of soils and groundwater. These threats are even more serious than threats to the more visible environment. The rapidly developing field of environmental geology seeks to clarify the science of the subsurface, to raise public awareness of its environmental problems, and to guide planners and decision-makers towards appropriate solutions. 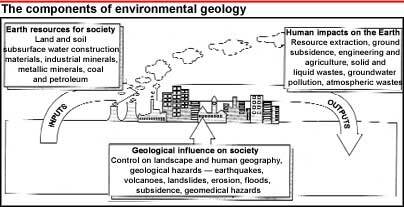 There are three facets to environmental geology. The first is concerned with finding the resources which modern societies require: the inputs to the economic system. Of these inputs, the most urgent demands by energy-hungry nations are for the fossil fuel resources of coal, oil and natural gas -- and geologists are employed to find them. Secondly, increasing resource inputs to society inevitably means increased outputs. Environmental geologists are being forced to devote increasing effort to assessing and mitigating the human impacts on the subsurface environment. The extraction of resources is itself a major impact. Mining of fuels and minerals can devastate natural ecosystems. Deep mining can cause ground subsidence, as well as changes in the water table. The stability of bedrock becomes crucial when it is to support large engineered structures. The Taj Mahal has remained stable on the soft sediments of the river Yamuna because of its well-designed pier foundations. Now the stakes are even higher, as for the purposes of engineering, geologists are asked to assess big dam projects such as Sardar Sarovar or Tehri. A third concern of environmental geology lies with predicting and managing the natural hazards that originate underground or are aggravated by geological factors. Landslides are an increasing geological hazard, both because of triggering by deforestation or road-building in mountainous areas, and by development in known risk areas. Even the understanding of the impacts of floods and cyclones requires geological inputs to identify risk-prone areas and devise damage limitation strategies. Naturally, public concern centres on these intermittent, catastrophic geological hazards. But there are more insidious threats to life and health from the underground environment. Excess or deficient chemicals in rocks and soils can constitute a geomedical hazard. A recently recognised hazard is radioactive radon gas, released by the breakdown of granite rocks that form a major component of the earth's crust. Breathed in confined spaces, radon is implicated in lung cancer deaths, a link that is already suspected in parts of Himachal Pradesh and likely to be far more widespread. Mapping the areas at risk, to inform a national monitoring programme, is an important geological task for the future. The scientific principles governing subsurface problems are well known. There is a need for heightened public awareness of the threats to this hidden environment. But for most of this century, geological science has been directed towards supplying resources to societies preoccupied with how long their reserves would last. Now the build-up of effluents from the use of these same resources is forcing scientists to look at society from the other end. Future economic growth may not be limited by lack of inputs so much as lack of sites to dispose outputs. The fragile subsurface should not be allowed to provide a short-term solution to this crisis.